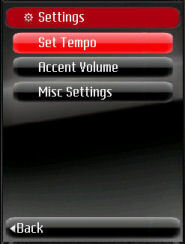 Accent Volume is used to set the volume of accented notes and none accented notes. Accents are typically used to emphasize the first note of a bar. Misc Settings allows the pattern editor to be silent, and to enable animations to be displayed when navigating screens. The latter is only worthwhile on phones which are optimized to run Java applications.